Discount BATA 2Pitch3 Pitching Machine - Free Shipping! •Two heads allow you to switch back and forth between two different pitches! The BATA 2Pitch3 pitching machine is the same machine that the pros use. It two different pitches from one setup. It includes a 10 Year Warranty and Ships Free to the contiguous USA. 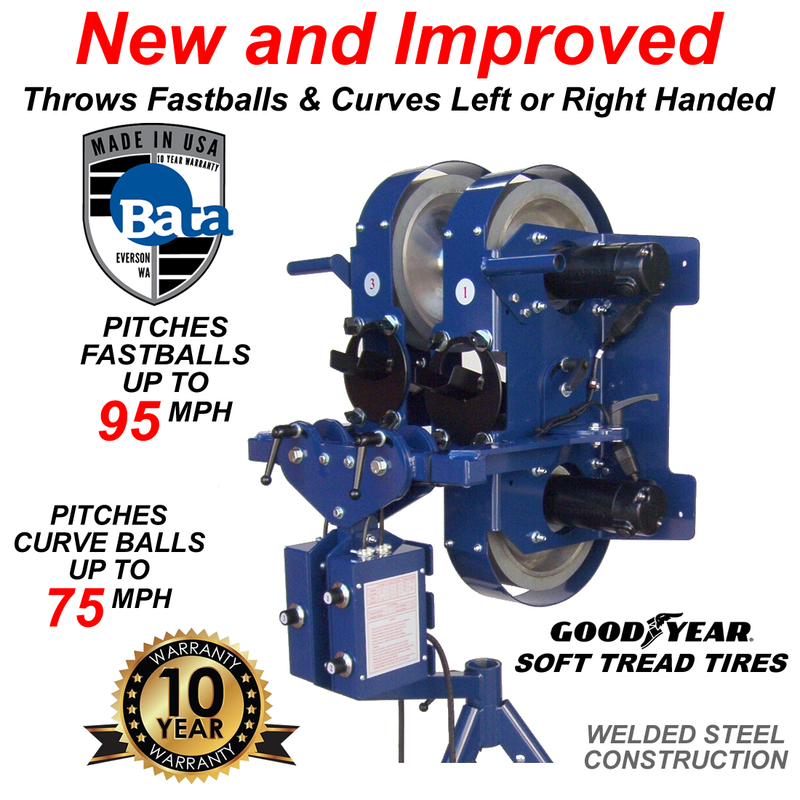 The new model BATA 2Pitch3 Baseball Pitching Machine lets you set up more different kinds of pitches and can throw them as a left hander or right hander from both wheel sets at any speed. There are two wheels on the curveball side and a single-wheel setup on the fastball side. No more pushing buttons, turning knobs and adjusting head angles between each pitching change, the BATA 2Pitch3 allows you to set up two completely different pitches and rotate between them, keeping the batter always guessing. Each wheel set has its own speed control, allowing you to throw everything from fastballs to knuckleballs, sliders and curves from the "fastball" wheel set at any speed you like and curve balls only at any speed from the "curveball wheel." 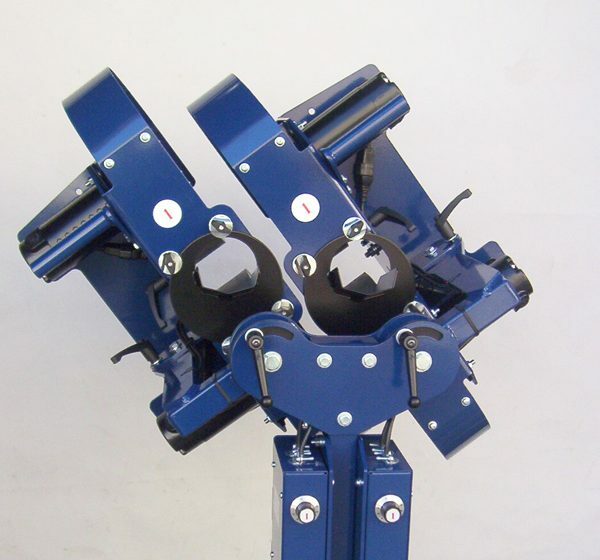 The height adjustments and inside/outside adjustments are also independent of one another, allowing you to throw to two different plate locations. Built to last for years, the BATA 2Pitch3 features solid rubber Goodyear Soft Tread pitching machine wheels as well as a heavy-duty solid steel stand and frame. Not only do the tires last longer than air filled tires, they pitch truer, always stay in balance and have a far shorter recovery time between pitches. 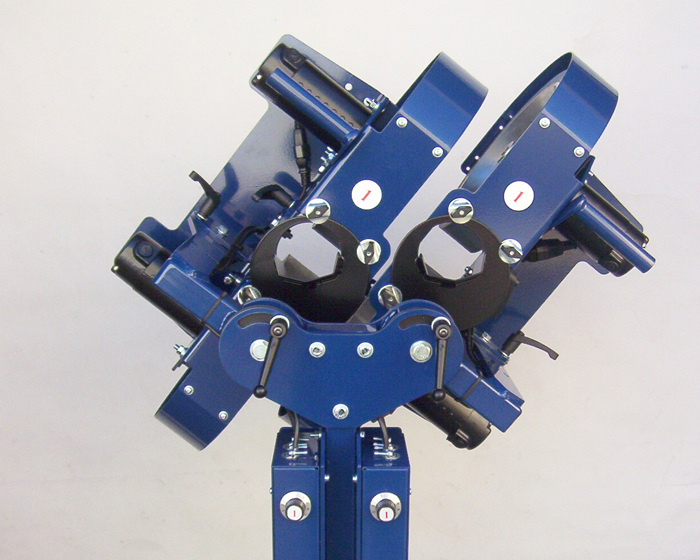 The standard BATA 2Plus3 Pitching Machine comes with a tripod stand. For easy transport, you can add a BATA Roll-Away Stand. For easy solo training, you might also want to purchase a BATA Auto Feeder. The BATA Auto Feeder can also be used with the BATA Cordless Remote. Don't forget to get balls for the BATA 2Plus3, too. BATA 2Pitch3 Pitching Machines are not "free to try" and they WILL NOT accept returns of their products unless there is something wrong with them, regardless of the reason. In other words, there is no "satisfaction guarantee" on their products. Any unauthorized returns will be refused and may incur additional charges for return shipping back to you! Every BATA 2Pitch3 pitching machine is thoroughly inspected and tested before leaving the factory. It is warranted to be free of defects from workmanship and materials for the period of ten years from the date of original purchase. If a part or the entire BATA 2Pitch3 pitching machine is deemed to be defective, it will be replaced. If the defect occurs within the first 3 years, the part or entire machine will be replaced free of charge and BATA will pay the cost to ship the machine back to you. If the defect occurs after the first 3 years, the part or entire machine will be replaced free of charge and the customer will pay the cost to ship the machine back to them. In either case, customer is responsible for the cost of shipping the part or entire machine to BATA Baseball. On all non-"wear-and-tear" parts, the part will be replaced or repaired free of charge. Tires treads are considered normal wear and tear parts and are not covered by this warranty. The BATA 2Pitch3 warranty is non-transferable. If you sell your machine, the warranty becomes null and void to the third party. 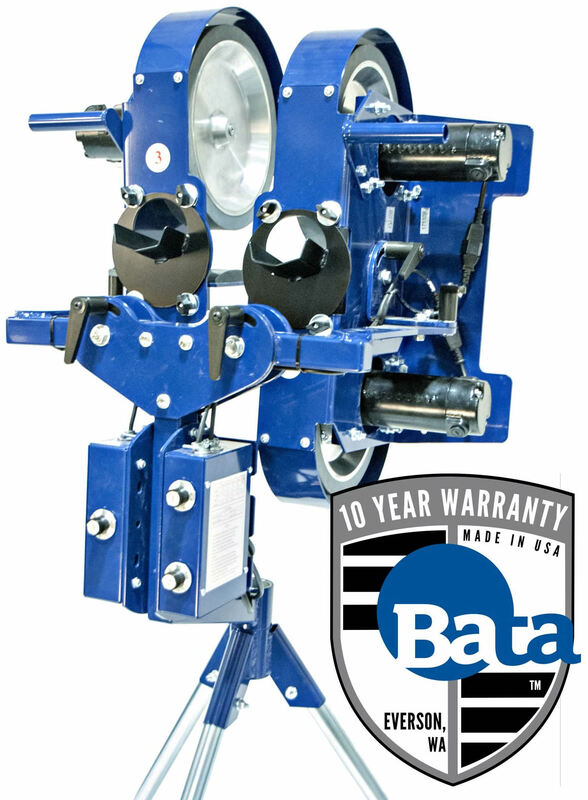 No matter where you order a BATA 2Pitch3 Pitching Machine from, NOBODY actually stocks them; they all ship directly from the manufacturer's warehouse located in Carlsbad, California. Therefore, the shipping time frame is exactly the same no matter what website you order from (we hope that it is this one!). 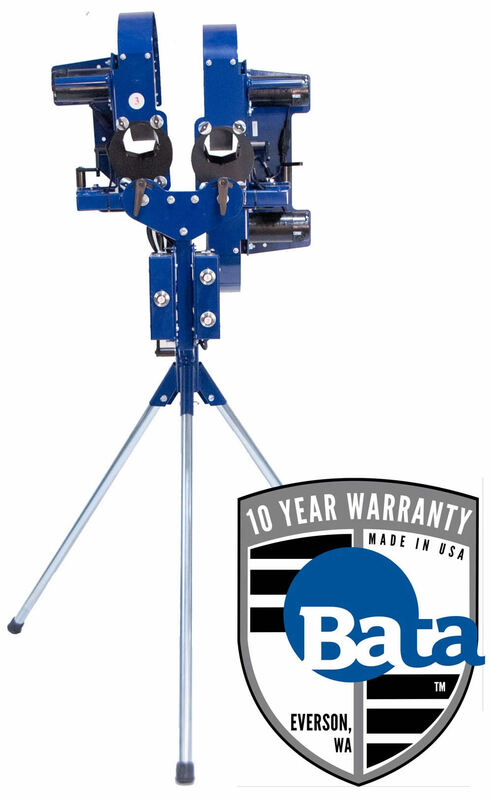 BATA 2Pitch3 Pitching Machines typically take 5-7 business days to ship from the time you place your order. They ship via United Parcel Service (UPS) and could take anywhere from a day or two to a week to get to you AFTER being shipped, depending on your proximity to their warehouse. We will notify you of your tracking number the moment we receive it from the manufacturer's warehouse. 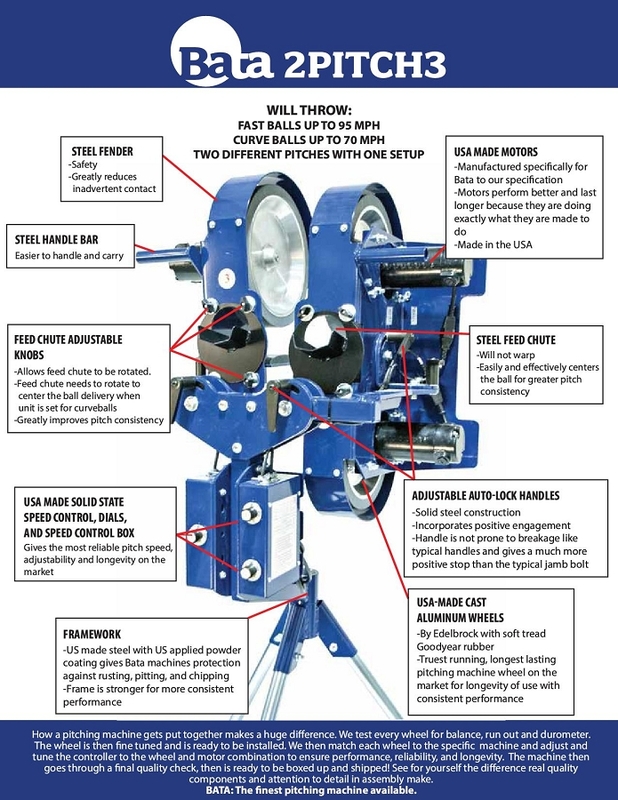 Click here to download an easy to read, printable PDF of the BATA 2Pitch3 Pitching Machine Owner's Manual.